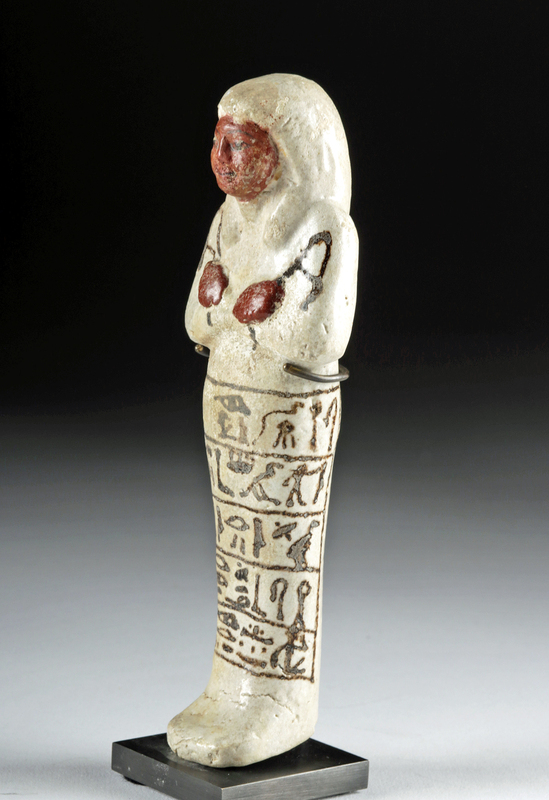 Ancient Egypt, New Kingdom, Ramesside Period, 19th Dynasty, ca. 1279 to 1213 BCE. 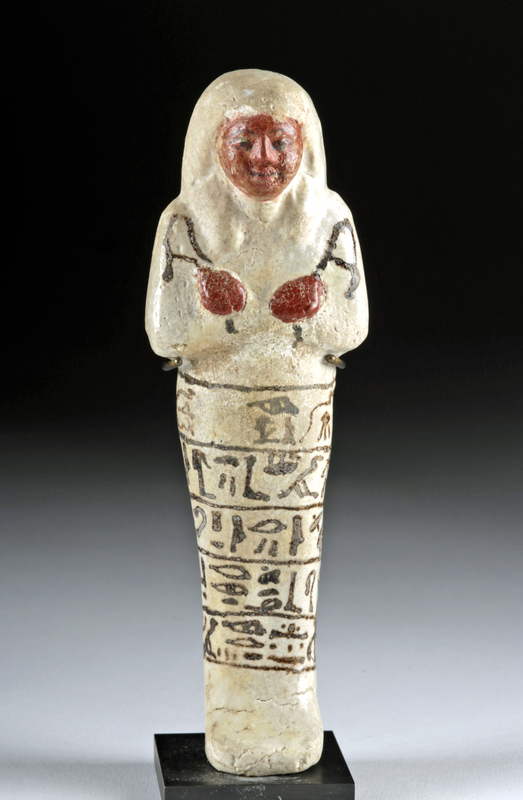 A gorgeous mold-formed faience ushabti covered in a clear glaze to show the white coloration beneath. 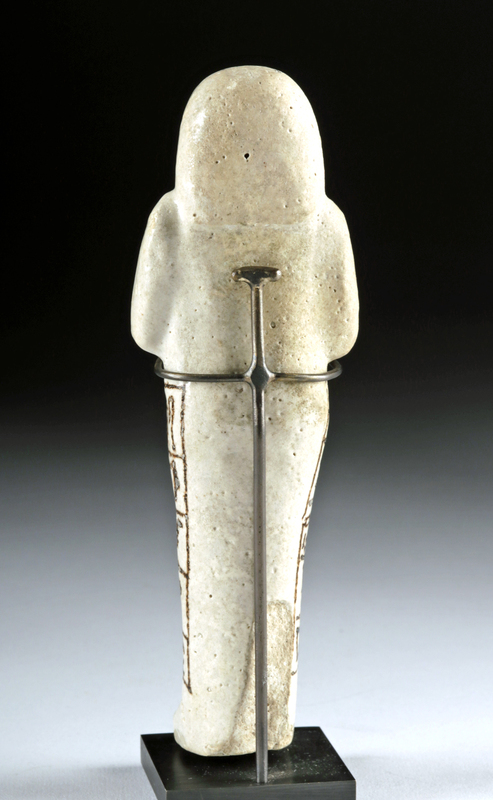 The figure stands in mummiform atop fused legs and holds the symbolic pick and hoe in arms crossed tightly over the chest. Almond-shaped eyes, a broad nose, thin lips, and painted brows comprise the serene countenance, and the head is covered with a tripartite wig. 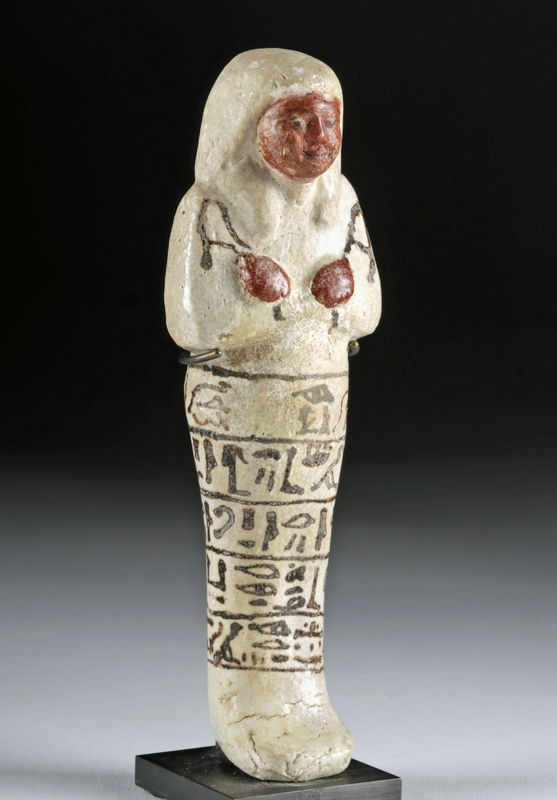 Deep red pigment adorns the hands and face of the figure, while applied black pigment creates the tools as well as the five registers of hieroglyphic inscription. The blank area in the top-most inscribed register is left blank, perhaps so the artisan could fill in a name once the figure was to be deposited within a tomb. The inscription would have mentioned the name of the deceased along with an invocation from chapter 6 of the Egyptian Book of the Dead (or Book of Going Forth by Day). Custom museum-quality display stand included. Size: 1.7" W x 5.375" H (4.3 cm x 13.7 cm); 5.7" H (14.5 cm) on included custom stand. The ancient Egyptians believed that after they died, their spirits would have to work in the "Field of Reeds" owned by the god of the underworld, Osiris. This meant doing agricultural labor -- and it was required by all members of society, from workers to pharaohs. During the Pharaonic period, they had become so necessary and elaborate that some tombs contained one worker for every day of the year and thirty-six overseers, each responsible for ten laborers. Workers like these are from that period of enormous proliferation, and are some of our best surviving insights into ancient Egyptian funerary practices. Condition: Restoration to entire face and parts of both hands, with resurfacing and overpainting along restored areas. Light charring to areas of black pigment, perhaps from firing at an elevated temperature for an extended period of time. Minor nicks to feet, body, and head, with light fading to original pigmentation. Light earthen deposits and nice craquelure to pigmentation throughout. Name appears to have been intentionally omitted.